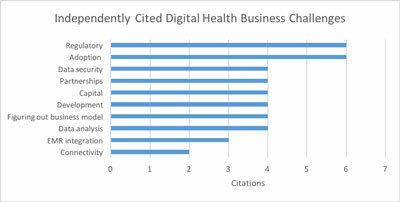 What are the top challenges digital health companies face? What are the top challenges digital health companies face? The results of a recent survey offer insight into which issues are causing struggles. In 2015 Portland medical device startup Otoharmonics launched a new tinnitus therapy device. The device incorporates a custom earphone and proprietary sound algorithms which are run on an iPad app. Unlike most other digital health devices this is a Class II therapeutic device. "As far as we know, this was the first Class II device incorporating an iPad to make it through the FDA 510(k) process and to receive the CSA certification for a medical device for electrical safety," says CEO Michael Baker. "In addition to the therapy this device incorporates a number of more "traditional" digital health features such as patient and clinician dashboards. As a regulated medical device it is quite interesting from a regulatory point of view and I predict we're going to see more and more personalized medical treatment applications in the future." Hear more from Scott Phillips at the MD&M East Conference, June 14-16, in New York City. He will be presenting "Digital Health Survey: How Your Competition Is Affecting Your Success," on Wednesday, June 15. What happens when digital health meets FDA regulation? One short answer is to read helpful FDA Guidance on mobile medical applications. We're not the only ones to notice that FDA has been markedly more open and helpful in facilitating innovation in the past few years. To get a deeper understanding of what companies are actually wrestling with, my company, StarFish Medical, recently completed a digital health device industry survey with communications help from Biocom, LifeSciences Washington, Medical Alley, Interface Health, MEDEC, MD+DI, and LifeSciences BC to promote the survey. Over 140 companies responded from across the industry, ranging in size from startups to 10,000+ employee multinationals. The median company size was just over 20 people. Sure enough, regulatory issues were one of the most-cited challenges. But there were a number of other challenges and risks raised within the comments section of the survey. We first asked respondents to group the issues they raised using free-form comments. We did this to avoid leading their answers. In many cases the issues raised in text answers include some significant nuances. For example, Adoption is raised as issue number two. Particular phrasing included "clinical workflow inertia" and "patient compliance." One company observed that "changing protocols to maximize the benefits of connected health" was a major challenge. In other words, the benefits could clearly be seen, but compliance is a challenge. Getting clinicians to change their workflow to something better and getting patients to actually use the systems is challenging. This same respondent noted the importance of having powerful internal champions within the clinical environment. This issue sounds reminiscent of the early adopter/late adopter problem the Geoffrey Moore wrote about in Crossing the Chasm. Determining a business model is also a new addition. Respondent expressions included "new product conception," "user group consensus," and "how to monetize it." 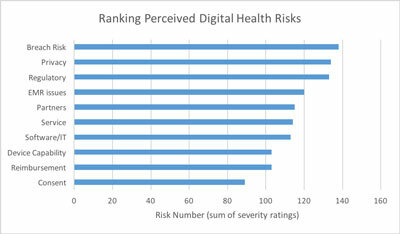 This is perhaps related to the reimbursement issues in the risk ranking. Figuring out a way to get paid adequately is clearly a common frustration and one of the core elements with which the whole industry is struggling. Several companies noted that deciding what to do with all the data is a challenge. I interviewed Geof Auchinleck, CEO of remote health company Claris. He mentioned that in his experience clinicians want nothing to do with a large volume of data that they don't understand the quality or meaning of, and they certainly don't want it in a patient record they will be responsible for. To him, the social challenge with digital health is much larger than the technology challenge. Entrepreneurial companies never have enough money or time to demonstrate the efficacy that will attract more capital, so it's not a surprise to see financial concerns high on the list. When asked to prioritize a list of 10 Potential Challenges impacting their program (from 1-7 with 1 equal to No Impact and 7 equal to Blocking), the surveyed companies produced the following ranking. We compared companies in development and companies with existing products. Both showed very similar results. The single largest risk they were concerned about was data security and the risk of hacking, followed by privacy. In the age of WikiLeaks and the Panama Papers those are sensible concerns. We anticipate that some larger infrastructure providers will appear with time to offer digital health data management and security within standard and cost effective models. Electronic Medical Records (EMR) integration issues are cited as well. Some of the related comments cited the diversity and complexity of integrating with many interfaces and then having to maintain them. We are familiar with challenges with the breadth of the Hospital Level-7 (HL7) protocol. Partner issues round out the top five. Most companies are not handling the full range of activities from web hosting to patient interaction to data storage themselves. They are relying on strategic partners and allowing themselves to focus. We have another chart, for another day, which digs into this partnership question in more detail. Reimbursement is also in the top ten. This is a frequently cited issue with this group. How to get paid? In many cases there is no reimbursement available and different financial models must be found. This article just touches upon a couple findings from the StarFish Medical Digital Health Survey for Registered Devices. Next month, at MD&M East in New York City, I'll be presenting a deeper dive into this study, including which features are being implemented and partnering trends. After all, digital health devices and services like those from Otoharmonics and Claris can engage and benefit patients, caregivers, and payers alike. The additional challenges are worth understanding for all medical device professionals. Scott Phillips B.A.Sc, P.Eng., is president of StarFish Medical, a medical device design company headquartered in Victoria, British Columbia.